An underwhelming movie that features a good performance by Eddie Redmane, but not a whole lot else. The proble with The Theory of Everything is that it really doesn’t get into the theories of Stephen Hawking very much at all. Considering the title, that is kind of ridiculous reality. This movie barely talks about black holes and space. Instead, it wants to be like every other film about a handicapped individual who is depressed about his life and capabilities. What we end up getting is a movie that wants to be A Beautiful Mind, but falls way short of the mark. It’s especially a shame since the acting here is so good. 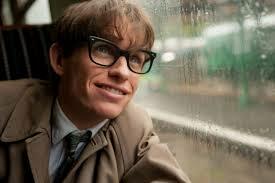 Both Eddie Redmayne and Felicity Jones, as Hawking’s wife, knock it out of the park. But the story is not up to their same level, and this ends up making all of the difference. Hawking was more than just a regular handicapped man who became known and honored. He was an inventor and a guy on the cutting edge of science. We are told this over and over again, but we are never actually shown it. This ends up being the biggest problem with the movie. To be fair to the movie the Theory of Everything, it isn’t just Eddie Redmane who provides solid acting. Felicity Jones does as well. She plays Steven Hawkings wife, Jane, and between the two of them, the acting is hands down the fest thing about this film. Redmane won an Oscar for his performance, and it was well deserved. Of course he went about one of the usual avenues to win with the academy. You either play handicapped, mentally handicapped, or a Nazi. Tropic Thunder featured a whole segment about this. So did the Ricky Gervais TV show Extras, where Kate Winslet was told what to do to win. A year later, she took the advice, played a Nazi in the movie The Reader, and won her Oscar. 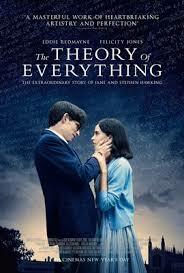 The Theory of Everything is very much a handicapped movie. That puts it in the company of some great films, like Awakenings, and some lesser ones, like The Diving Bell and the Butterfly (also an Oscar favorite, by the way. Just saying.) The parts that deal with the capabilities and lack thereof involving this man, are pretty interesting. These include when Hawking first gets an electric wheel chair, or when his wife tries to use a tool with letters on it to communicate with him so that he can direct her to letters and spell out words. The problem is that there aren’t enough of these moments, and that there also isn’t much of a buildup. For a movie called The Theory of Everything, there really isn’t a whole lot of theory or explanation of it anywhere to be found. I learned more about Hawking’s ideas on black holes from Donnie Darko. Even in movies like Event Horizon and Interstellar, we got physical displays of how all of this works, seeing paper get folded to represent a worm hole bending time and space. In this movie, however, nothing. The movie starts out with Hawking and some friends at a party. He starts talking to Jane, and it is very difficult to either hear or make out what they are actually saying. I’m pretty sure they ask each other about their majors at the university. Then he tells her his theory of everything, which is simply that everything in the world is connected. This scene really needed to hook the audience in some way, be it a funny encounter for a first meeting or a really interesting theory and presentation of it. Unfortunately it did neither one of these. Hawking runs into Jane at a local pub and asks her for a date on Sunday morning. She says she will be at Church. So he waits outside the Church for her to be finished, and the two of them go off to play a game of croquet. In this movie it’s sweet and charming. In reality he’d be considered a stalker. From here, he brings her over to his parents house, and then out to a ball. It’s a break- neck pace that doesn’t take any time to enjoy the details. Hawkings big fall occurs while he is quickly walking through the campus. His muscles immediately start deteriorating and he tries to push Jane away. Only she won’t have it. There is a great croquet scene where he tries to move around from one shot to the next, and she really gets to see how bad his physical condition is. Despite this enormous obstacle, Jane tells Hawking that she loves him. She sits down with his father, who explains to her how tough things are going to get, and Jane is not deterred. She tells him that despite what people think, when they look at her, she is pretty strong. Hawking’s ideas are celebrated by others, and we certainly get that he is a sensation. It just would have been nice to know exactly why. What did he come up with that was so genius? There is an interesting scene where he and Jane invite a bunch of close friends over for a dinner party to honor Hawking’s success, and he ends up just hanging out on the staircase by himself, having a meltdown of self pity. In the second half of the movie, and new character is brought in as a friend of Jane’s, who she meets at Church. This man becomes a close family friend and helps take care of both Hawking and the children. He spends family days with them, such as an outing to the beach. There’s nothing going on between Jane and this man, yet Hawking uses it to slowly start pushing Jane away. He stops telling her about conferences overseas that he will be attending with his female nurse. This is the most interesting part of the movie. Unfortunately it comes at the very end. This is what propels he and Jane to splitting up. I like how the movie shows that she really did everything she could to make it work with him. Regarding the handicap element, this movie gets gag down just fine. It’s the theory part that’s missing. Finally, towards the end of the film, the conflict between hawking as a man of science and Jane as a woman of religion is brought out. It’s about time. All of this taking place at the end simply adds up to a situation of too little too late.